From modern to Medieval, these towns capture the essence of a remarkable pilgrimage. Exciting faith-based group tours are easy to plan and develop when you have two extraordinary Swiss cities with exceptional religious significance on the itinerary. With the Luther Decade activities coming to a conclusion in 2017, groups are preparing journeys that offer a mixture of religious sites, historical attractions and recreational opportunities. Both Geneva, situated on Lac Leman, and Basel, located on the Swiss-France border north of Geneva, combine for an attractive agenda with a combination of pilgrimage sites, dramatic lake landscapes and a Medieval Old Town, among many other high points. Geneva, the second-largest city in Switzerland, is a modern, bustling city featuring spectacular views of Mont Blanc, and offering a number of important religious highlights. John Calvin, the protestant reformer second in importance only to Martin Luther, led the Reformation from Geneva for decades.Through the years Geneva became a model of the ideal Protestant city, and reformers from all over Europe came here to study and learn from Calvin and his colleagues. The Reformation is commemorated in the 325-foot-long x 30 foot high Reformation Monument at the Parc des Bastions. The monument is built into Geneva’s old city walls. Another city highlight is the International Museum of the Reformation showcasing the history of Geneva and the Reformation. It traces the movement that spread during the 16th century through objects, books, manuscripts, paintings and engravings. The museum is located on Cour Saint-Pierre in a 19th century historic building. The Cathedral of St. Peter is best known as the church where Calvin gave his inspiring sermons during the mid-16th century, and the imposing Romanesque-Gothic church with a Neoclassical facade still dominates the center of this city. The site of the church has been occupied at least since the 4th century. The Scottish reformer John Knox preached at the Auditoire de Calvin between 1556 and 1559, and Calvin founded a Christian academy here in 1559. The Auditoire, a 13th-century Gothic chapel built over a 5th century church, is located next door to the Geneva Cathedral. Geneva also embraces other places of worship, including a Russian Orthodox church, an Anglican church, two mosques and two synagogues. It is also the headquarters of global organizations like the United Nations, Red Cross and Red Crescent, and the World Council of Churches. Other highlights of the city include the quayside of Lake Geneva, numerous old alleyways and the many smart boutiques. 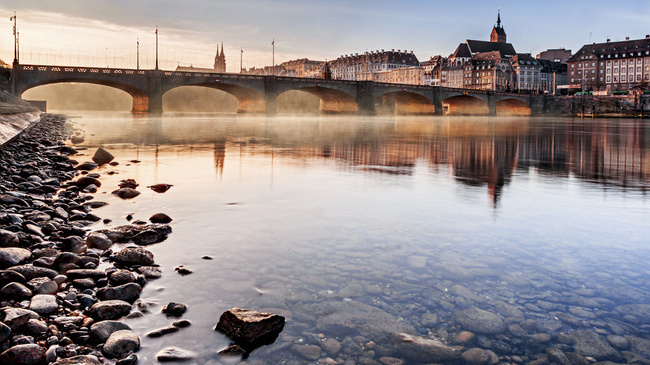 Basel, with more than 2,000 years of history, presents an exciting contrast to its newer, modern architectural face. The city of 200,000 is home to Switzerland’s oldest university, founded in 1460 and has a beautiful Old Town featuring cobblestone streets and historic landmarks. The richly-decorated red sandstone town hall and the late Romanesque-Gothic Münster Cathedral, where the Romans built a military outpost in 30 B.C., are two of the many city attractions. Known today for its quality of life throughout the world, Basel was heavily involved in the early days of the Reformation movement. Starting in 1521 the city council renounced their obligations to the Bishop, and many of the Catholic church’s practices were abolished. An influx of Protestant religious refugees from other countries gave the city an economic boost, especially in the silk trade and eventually silk ribbon weaving, which for decades was the city’s most important industry. Basel’s importance to the Reformation is also said to stem from printing and paper manufacturing. Key reformist texts were printed in Basel, as were writings which prepared the way for the Reformation, such as the edition of the Greek New Testament in a new Latin translation prepared by Erasmus of Rotterdam, as well as a second edition. Erasmus, one of Europe’s most famous and influential scholars, died in Basel in 1536 and is buried in the Basel Münster. Calvin’s famous Institutes of the Christian Religion was also printed in Basel in 1536. Many historic churches are part of the Basel landscape, and there are nearly 40 museums which makes Basel the city with the highest density of museums in the country. Internationally known museums such as the Kunstmuseum Basel “Museum of Fine Arts”, the museum devoted to the iron sculptor Jean Tinguely, the Fondation Beyeler and the Museum of Cultures attract many visitors, as do galleries and theaters. Basel features a wide range of classical and contemporary productions on the stages of the Basel Theatre and the Playhouse, while the city’s Botanical Gardens, parks and the banks of the Rhine are perfect places to relax and linger. Basel has also become an important architectural mecca, with numerous avant garde construction developments.